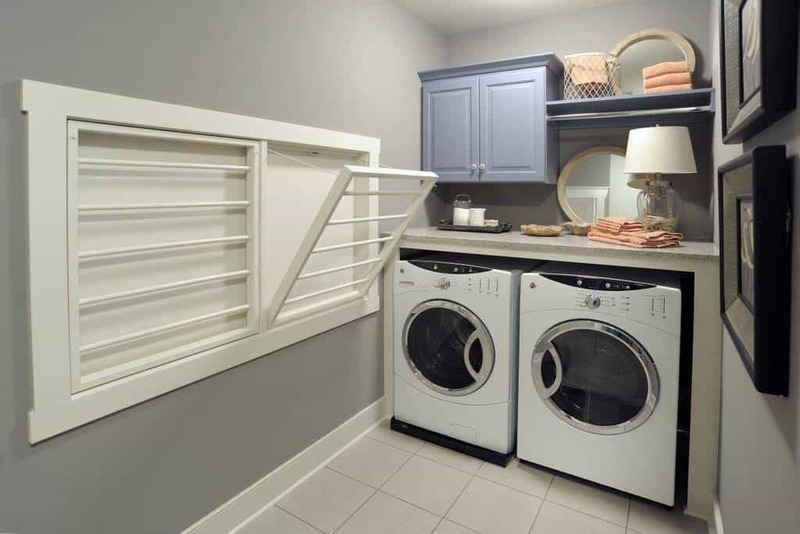 Unfortunately, unless you have someone do you laundry for you, you will be spending a decent amount of time in your laundry room. While doing laundry isn’t necessarily fun, you can make sure the room you do it in matches your personality. 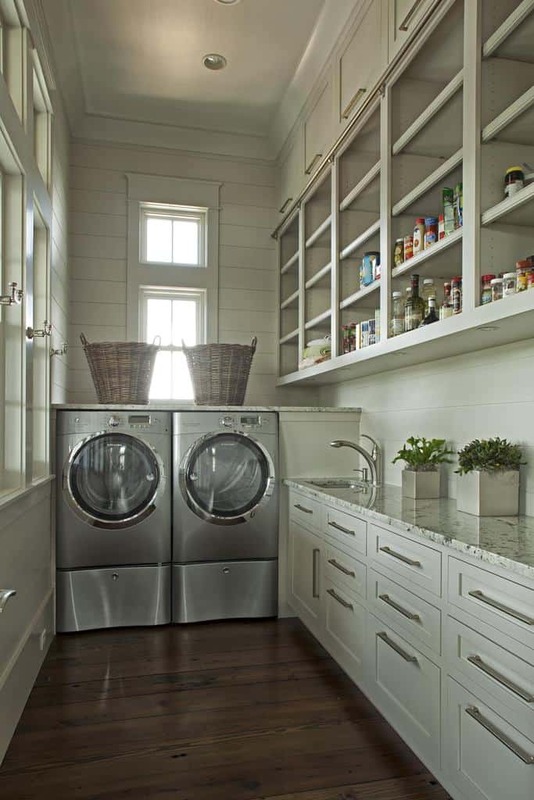 When deciding on your design for your laundry room, consider your needs and space requirement. 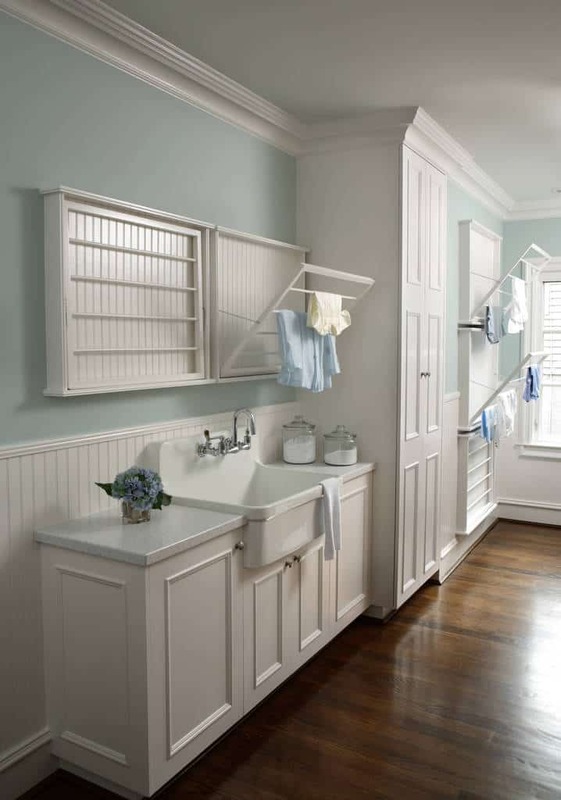 You don’t have to have a large space for your laundry room, and we will show you some space saving ideas below. You can always have some fun decor in the room and you can have any color scheme you want. 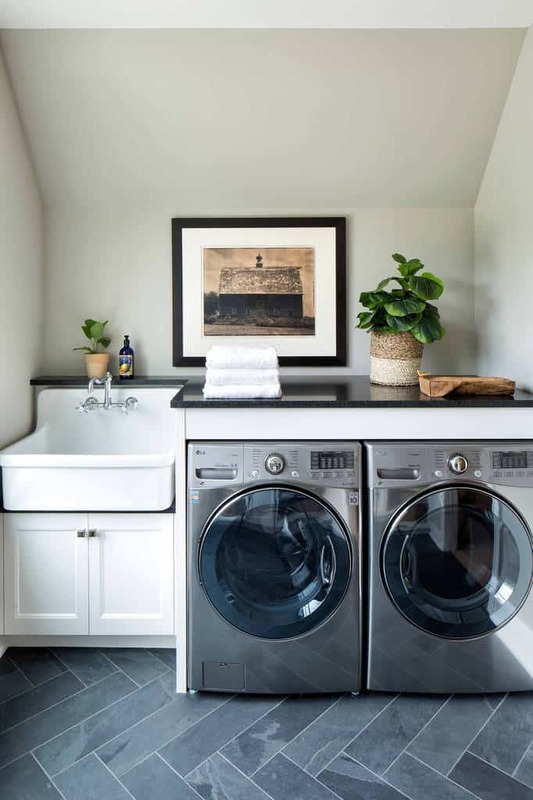 We have gathered 30 images of great laundry room ideas for you to look at. Check them out and get motivated! With an industrial feel thanks to the exposed brick walls, this room matches all the way around. From the appliances to the tiles, this color scheme works. Photo by Albert David Design Inc.
Having a sink in the laundry room is a great way to get rid of those extra hard to get out stains. This room is sleek and organized. 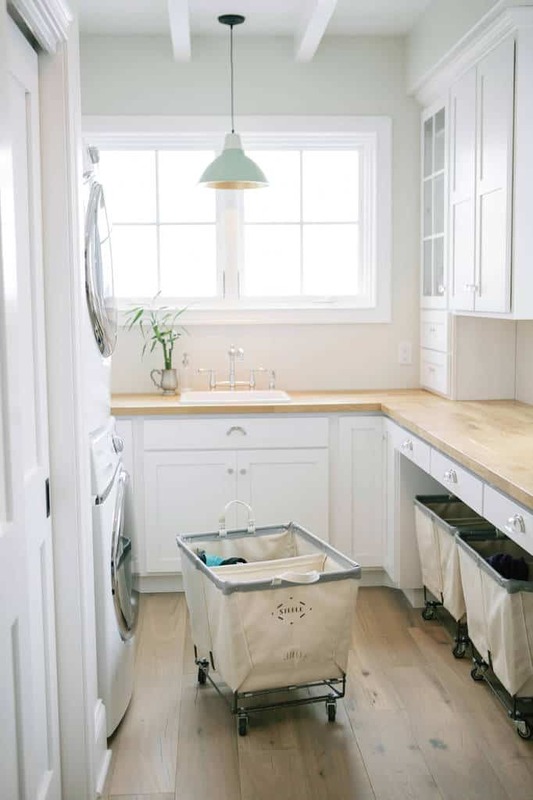 With rolling hampers in place to make laundry easier for you, you have a perfect space to get the dreaded laundry done. 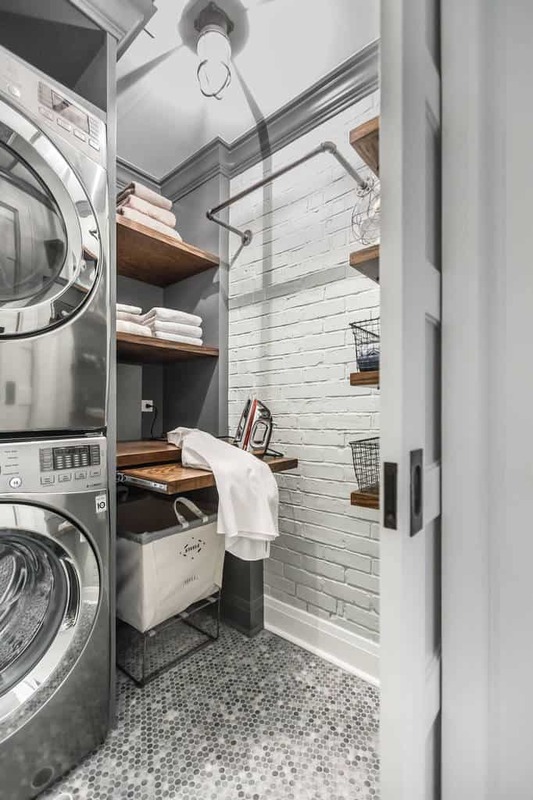 Photo by VanBrouck & Associates, Inc.
Slide open the doors to get into this wonderful laundry room. 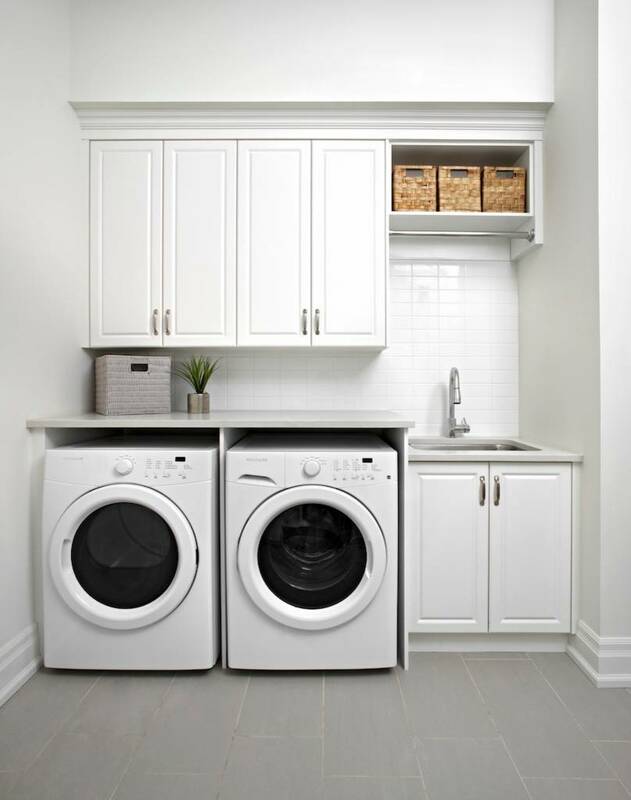 With a stackable washer and dryer to save space, you have plenty of room for everything else. 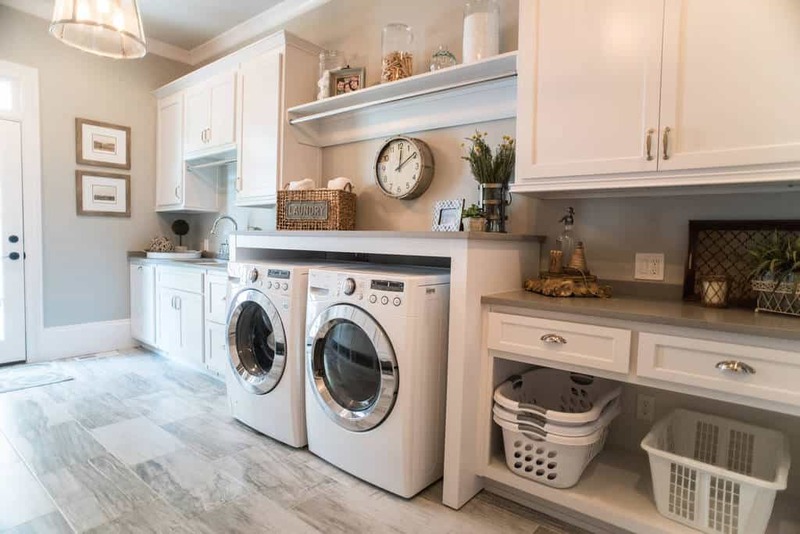 With a beautiful stone style floor in this laundry room, this space has a wonderful country feeling and it gives you plenty of space and accessories to get your laundry completed. 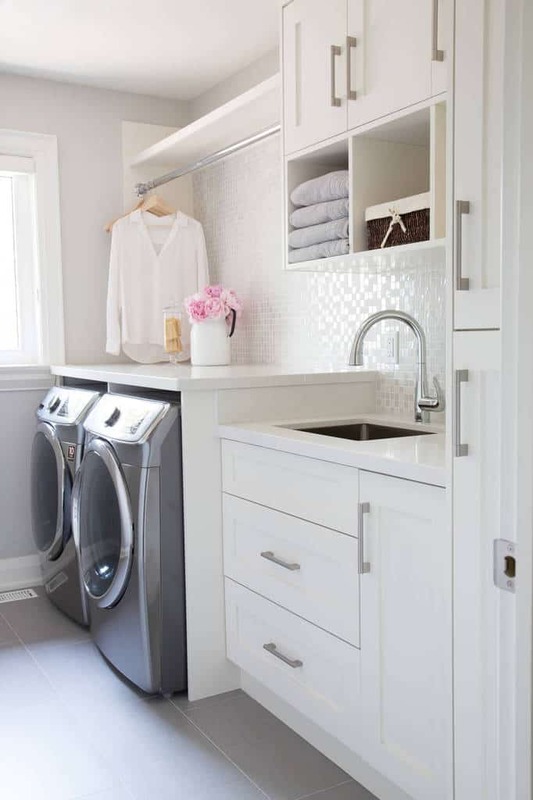 Laundry rooms aren’t just for laundry. You need somewhere weather proof to wash the dog as well. To top it all off, the dog has a nice place to rest when you are out. 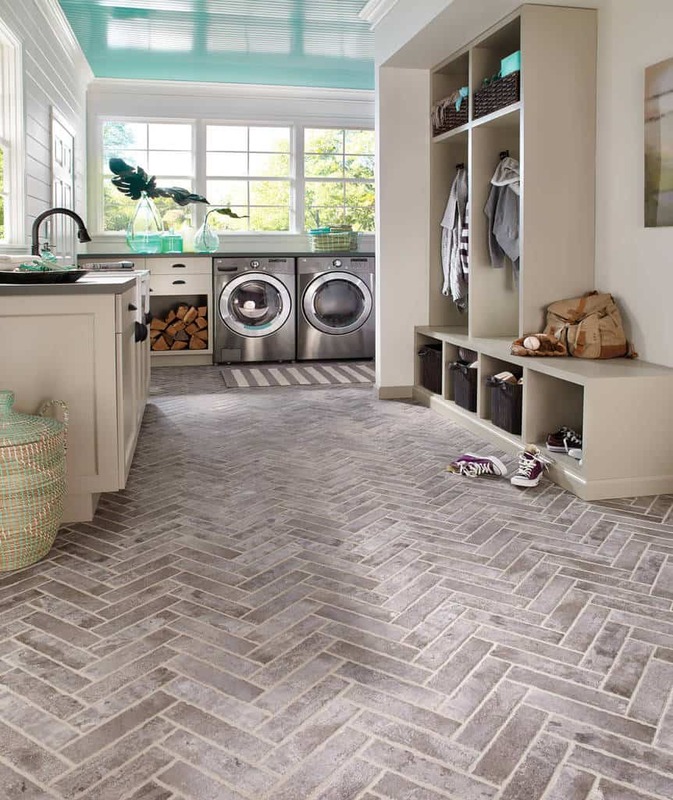 The darker tile chevron style floor is the perfect match for the color of the washer and dryer. With a farm style sink to give the space more character, this room is fantastic. 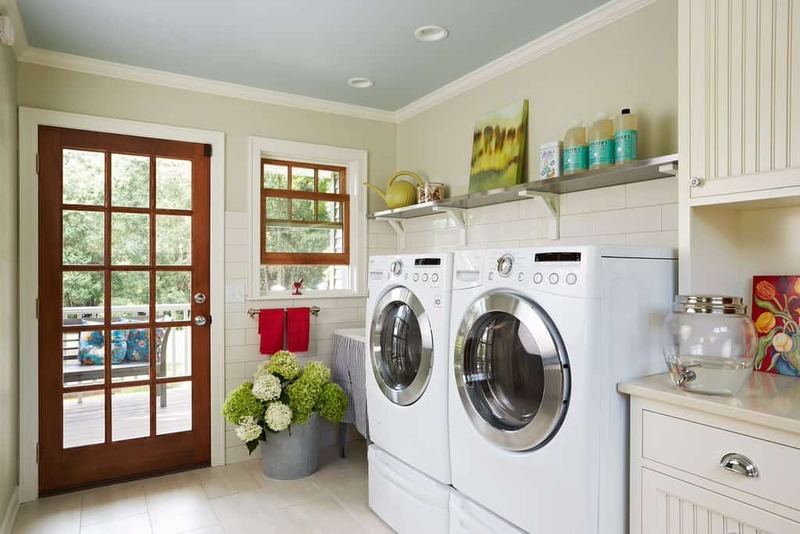 Add in some colorful decor to show off your personality in the laundry room. This space has great artwork and fantastic flowers to give it a country style. These laundry racks have many uses, like letting some of the items that don’t need a dryer to get all dried off. Use this farm style sink to get some of the heavy work done. Photo by M S International, Inc. 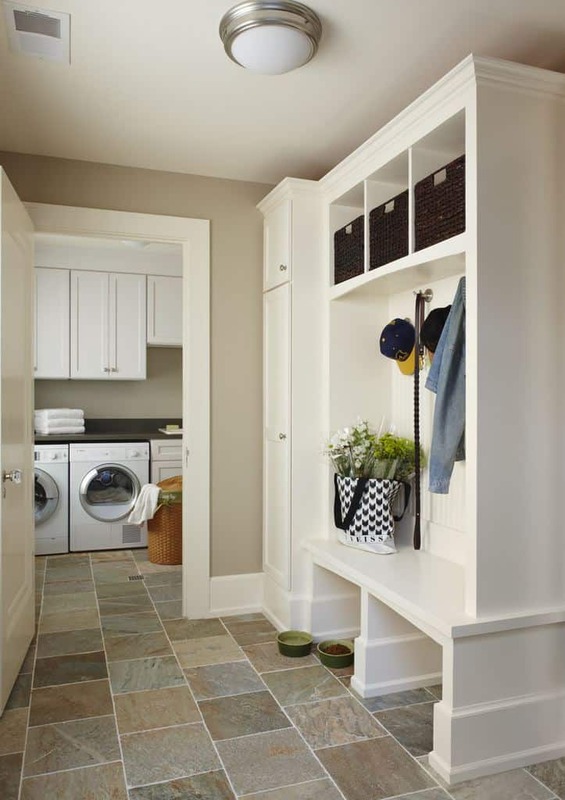 Sometimes it makes sense to combine the laundry room and mudroom together. It is a place that you can get dirty clothes off and right into the laundry. 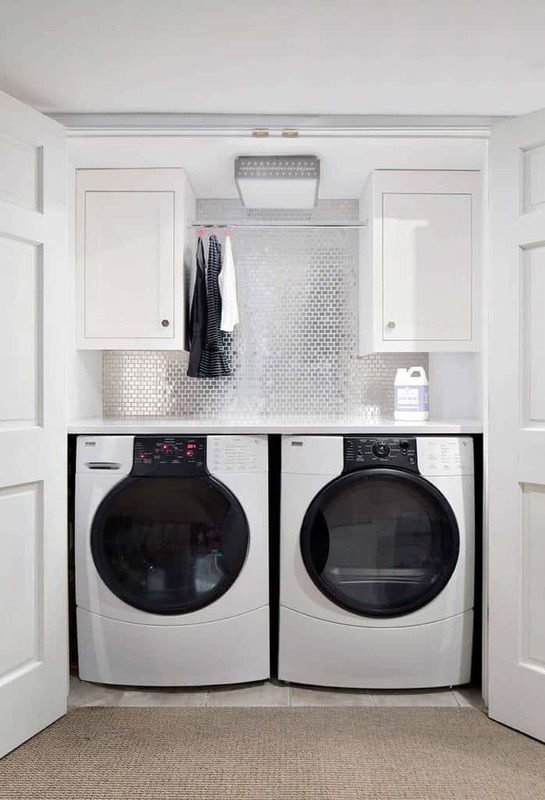 The metallic tile designs behind this washer and dryer give this laundry space a sleek and modern look. 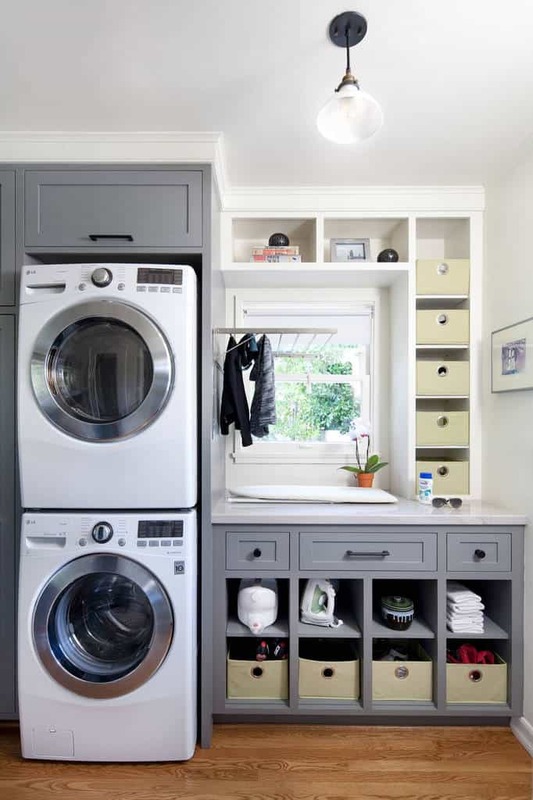 With sleek and contemporary drawers and shelves, this laundry room is bright and cheerful. With plenty of natural light shining in, this space is wonderful. What a wonderful use of hardwood with the design of this room. 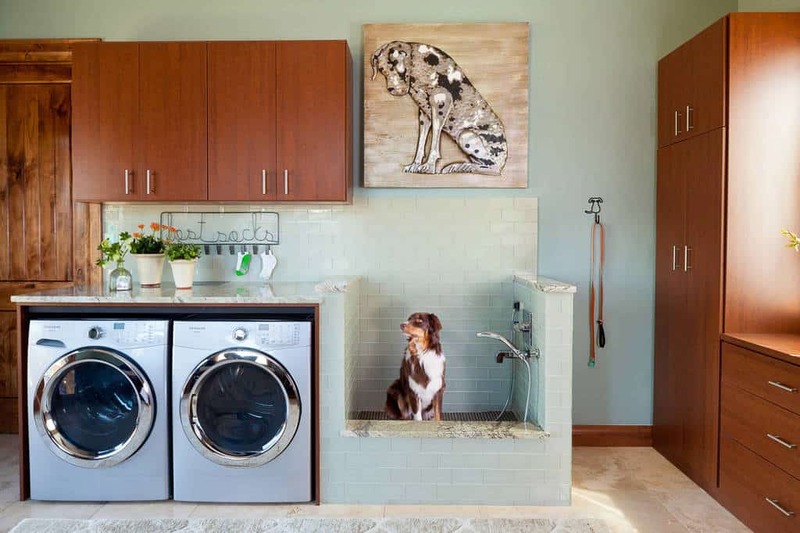 There is a space to give your pets a bath and a get your laundry done, too. 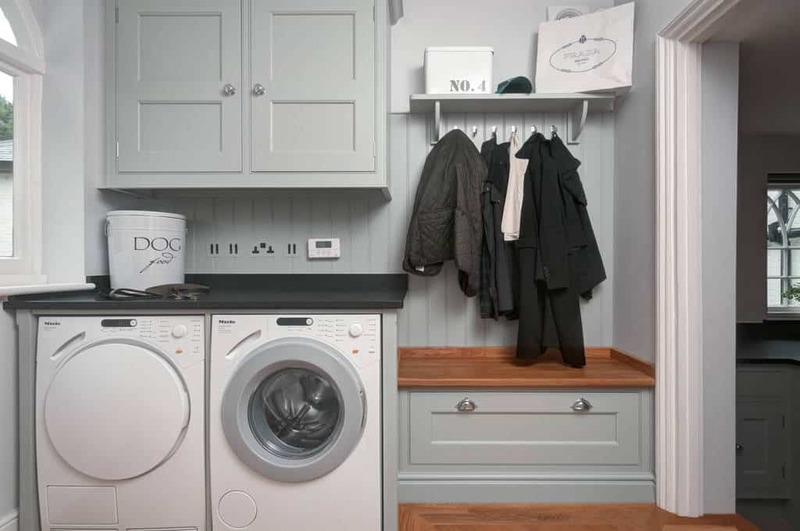 With a great bluish gray color for the walls to blend with the hardwood, this laundry room has a modern country style. 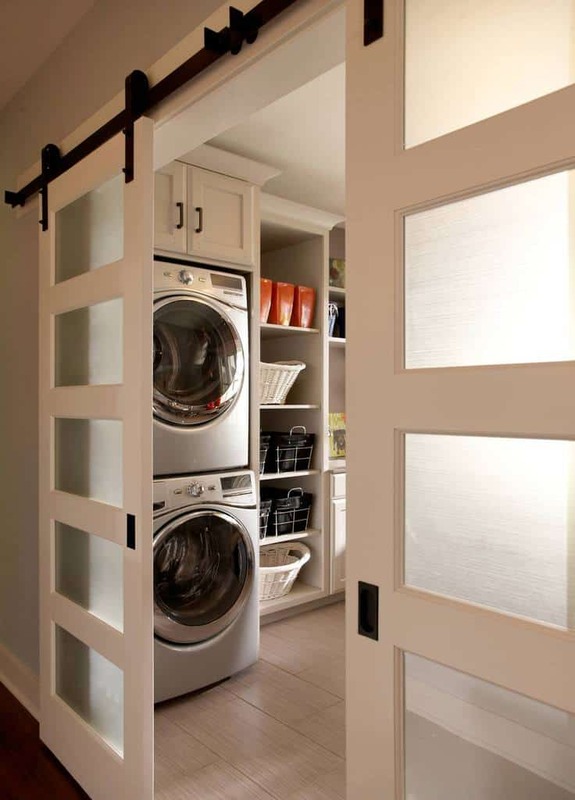 You don’t have to do much to add in some style to your laundry room. This space uses different shades of color throughout and has simple decor. 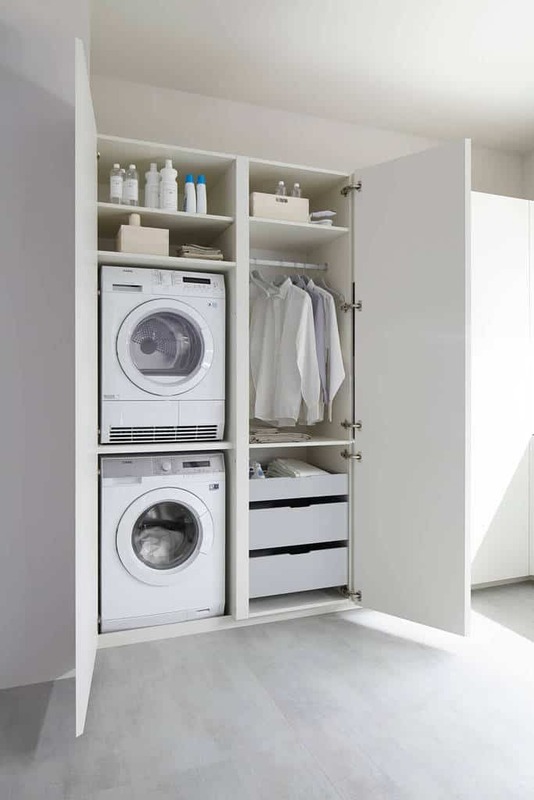 Having this stackable washer and dryer setup certainly saves space. 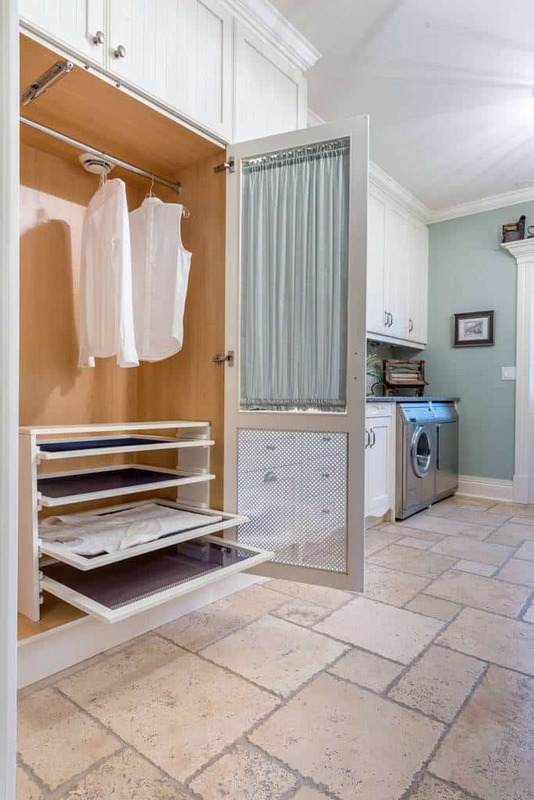 This laundry area all fits neatly behind a door to keep everything tidy. This setup will be especially helpful when you come in with dirty clothes. You can get them right to the laundry room. With a great stone style floor connecting the two, this space is fantastic. Why would you wan to keep a cumbersome ironing board around when you can have it neatly tucked away in a drawer and ready for use. Just open up and fold it out. The tiles used around this room shine in the natural light that pours in. Everything here is bright and cheerful thanks to the light color scheme. 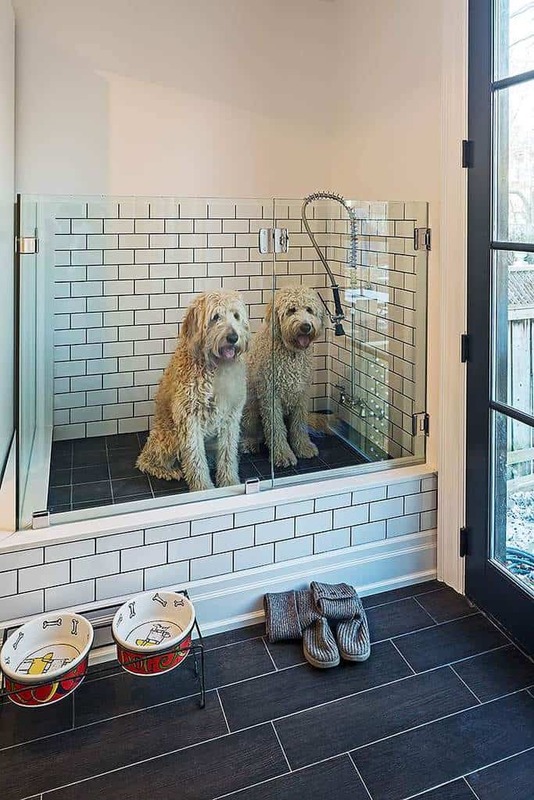 Don’t struggle trying to get your pets washed in the bathtub or outside anymore. Having a simple area like this ensures you can keep your pets clean year round. This laundry room doubles as a pantry. Make the most of the spaces you have and combine where you can. The hardwood floor used here give the room great character. 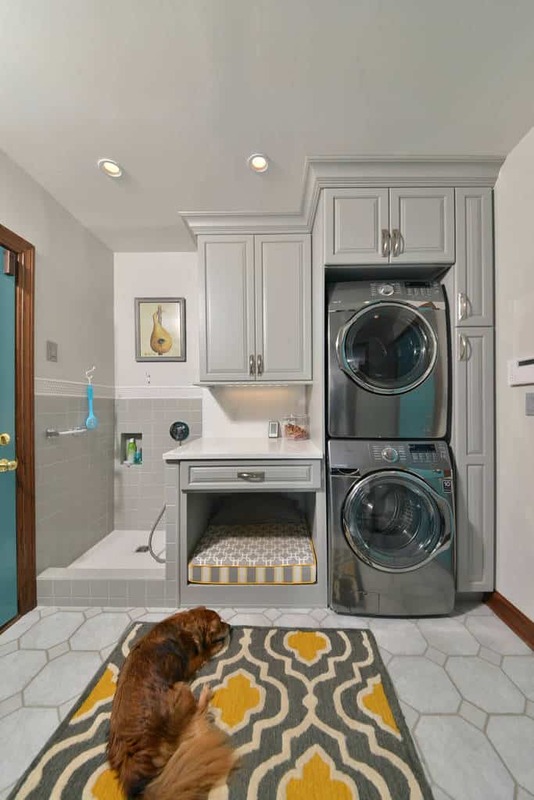 Just because it is a laundry space doesn’t mean it can’t show off your personality. This space has great decor and really welcomes you to it. With a great pattern used for the shelves and drawers here, this room takes an almost futuristic style. 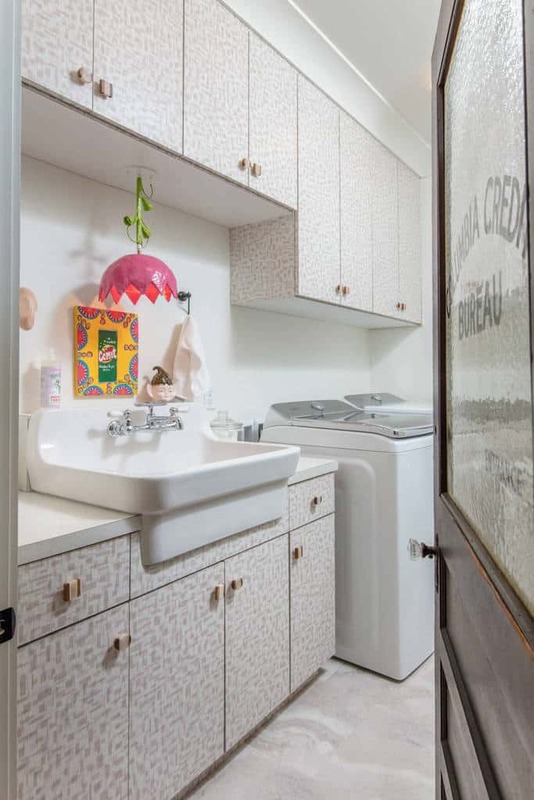 With the colorful decor added for some fun, this laundry room is a great space. 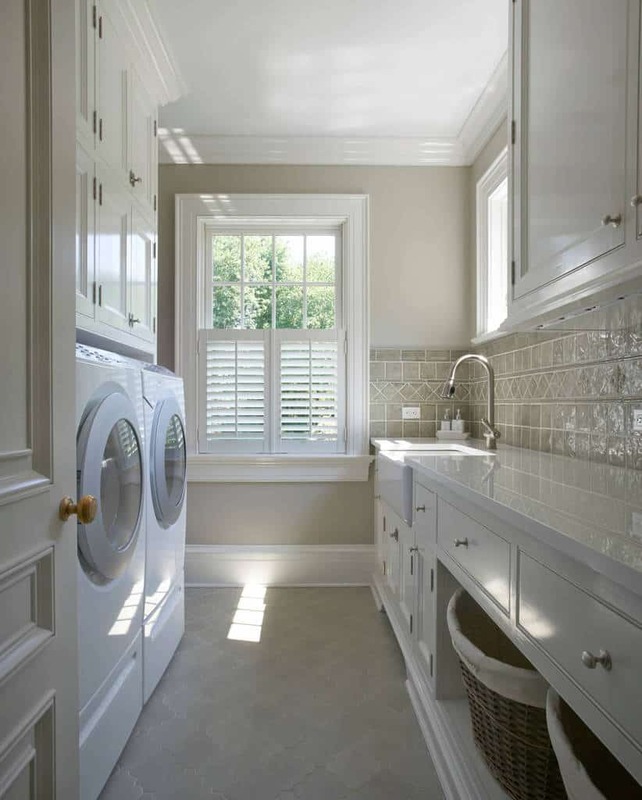 This laundry room takes on a classic and elegant style with its design. 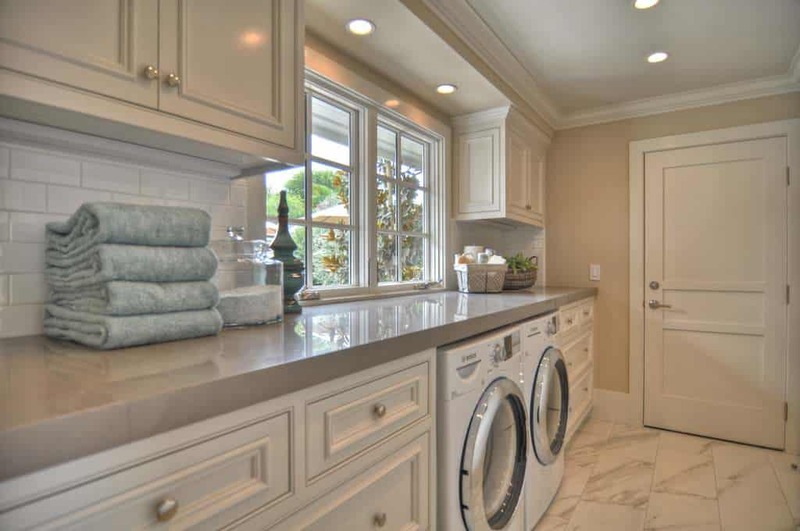 With great lighting and well designed cabinetry, you may forget it is a laundry room. You always want to have enough storage for all of your needs. 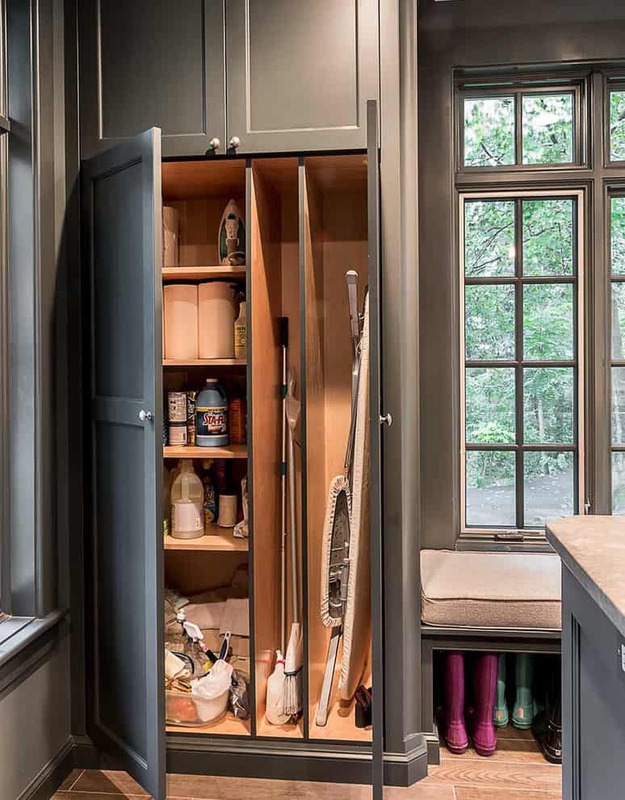 This space keeps everything from cleaning supplies to the larger items like an ironing board and brooms. 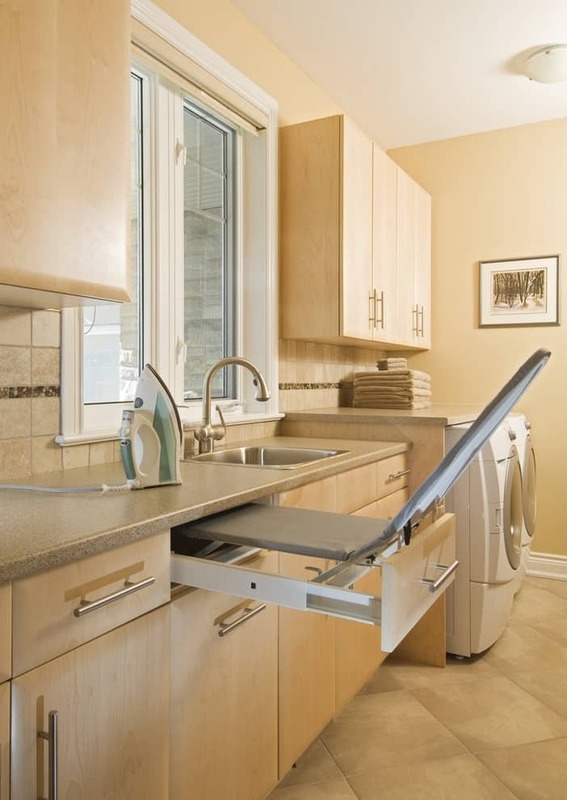 Another great example of how a stackable washer and dryer really save space. 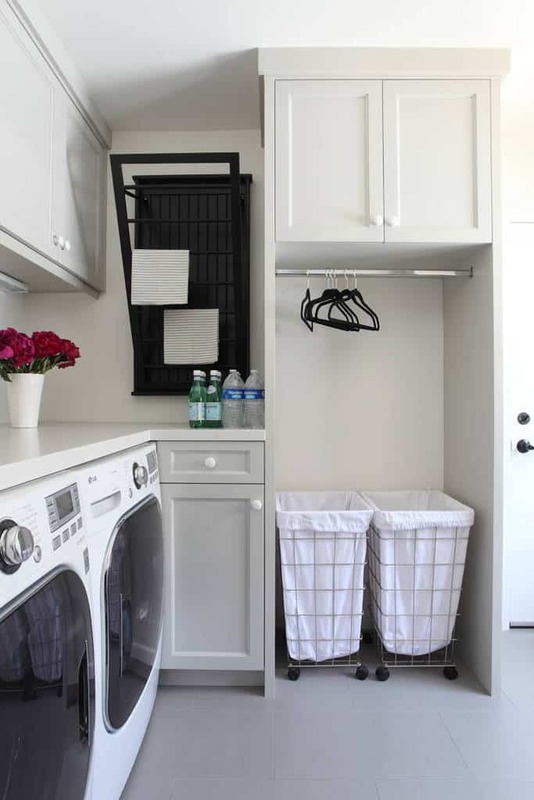 This laundry room has an area for everything to help keep you organized. 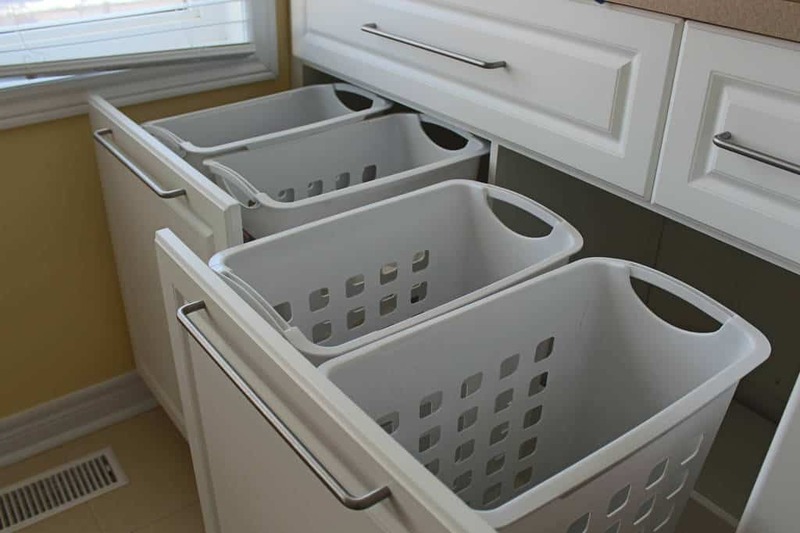 These drawers really area a great way to keep the laundry hidden away and organized until you are ready to wash it. 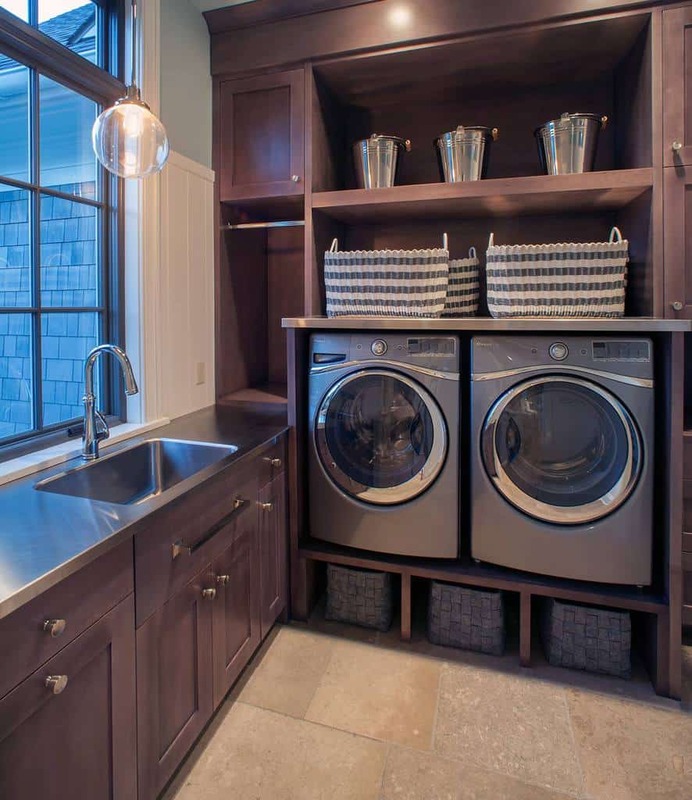 With the dark hardwood designs blending with the sandstone-like floor, this laundry room has class. The stainless steel counter top works well here. 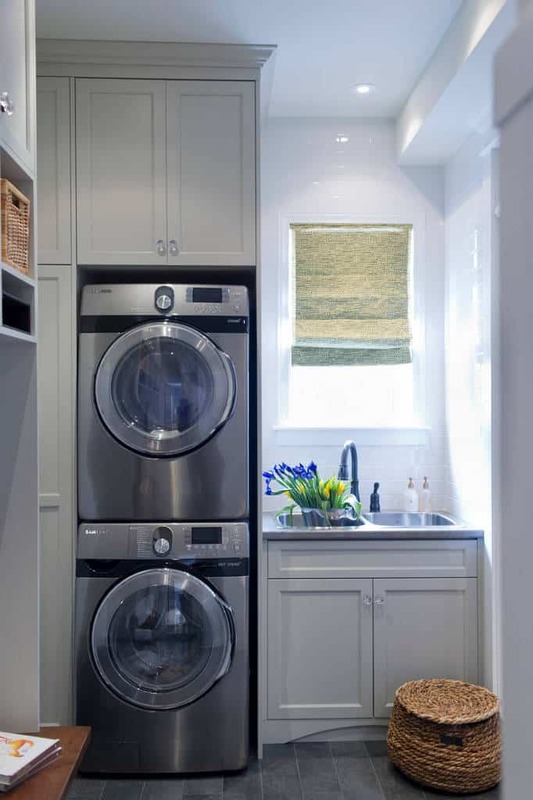 This laundry room uses a great color scheme to add some life to the room. The stackable washer and dryer really save some space. This is a neat way to keep your dirty laundry organized before you wash it. Like an industrial space, roll the buggies out when you are ready for them.